Trump Travel Ban: Refugee Resettlement Groups Glad For Stay But Worried Refugees and resettlement agencies around the U.S. are facing uncertainty as the courts decide what happens to the U.S. refugee program, but donations for refugees are piling up as agencies wait. 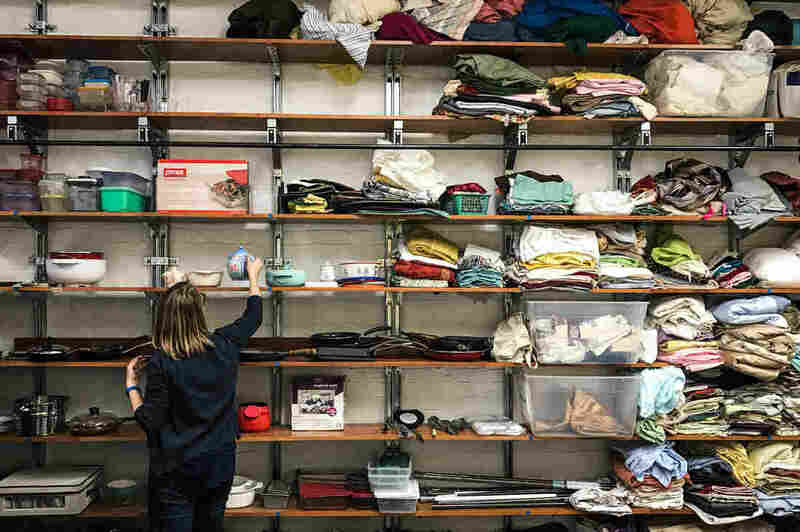 Betsy Jenson sorts through donated kitchenware, bed sheets and other household goods inside a storage area for the Nationalities Service Center in Philadelphia. The refugee resettlement agency uses donations to furnish apartments for newly arrived refugees. Many resettlement agencies are relieved refugees can once again come to the U.S. now that a federal judge has blocked President Donald Trump's executive order that suspended the refugee program. So far, the 9th U.S. Circuit Court of Appeals has denied a request by the Trump administration to restore the temporary refugee ban. But this open door to refugees could close at some point depending on what the courts decide. Many refugees and workers at resettlement agencies are stuck in limbo. "I don't know how long I will have this job, because we are thinking there will be some layoffs if this continues," says Omar Mohamed, a case manager for Church World Service of Lancaster, Pa.
Local agencies worry they will no longer get the federal funding they need to provide services not only to new arrivals, but also to refugees still getting settled into their new country. Mohamed says there's still a lot of work for case managers to do with refugees after they move into their new homes. "Everything is new to them — this new culture, new people, new language," he says. "We have to teach them from zero." 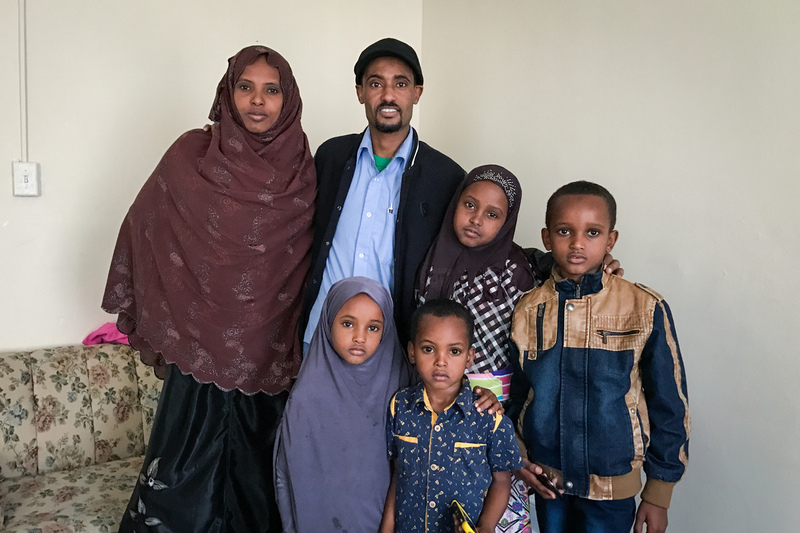 Mohamed Muhumed was recently reunited in Lancaster, Pa., with his wife, Ferehiya Areb Tahir, and their four children, who arrived in the U.S. from a refugee camp in Ethiopia 10 days before President Trump announced his temporary suspension of the refugee program. Mohamed Muhumed's family arrived in the U.S. about three weeks ago. He recently moved into a three-bedroom apartment in Lancaster with his wife and their four children. An orphan at three years old, Muhumed fled Somalia and waited 23 years in a refugee camp in Ethiopia to be resettled. In 2014, after multiple interviews and security screenings, he finally moved, by himself, to central Pennsylvania, where he now works as a fork-lift driver. His wife and children joined him in Lancaster 10 days before Trump announced his temporary ban on refugees. "I feel very, very happy," says Muhumed, who adds that his family had "good luck" to arrive before Trump's executive order. In Philadelphia, Paw Wah doesn't know if she'll ever see her family reunited. She escaped persecution as a member of the Karen community, an ethnic minority in Myanmar, also known as Burma. Last year she moved out of a refugee camp in Thailand with her husband and their three young children, leaving behind their eldest daughter. Wah was planning to make a meal of fish paste, vegetables and soup to welcome her daughter to Philadelphia in late January — until Trump issued his refugee order. The flight to the U.S. for Wah's daughter was canceled and hasn't been rebooked yet, according to staff at the Nationalities Service Center, a refugee resettlement agency in Philadelphia that would help her once she gets off the plane. 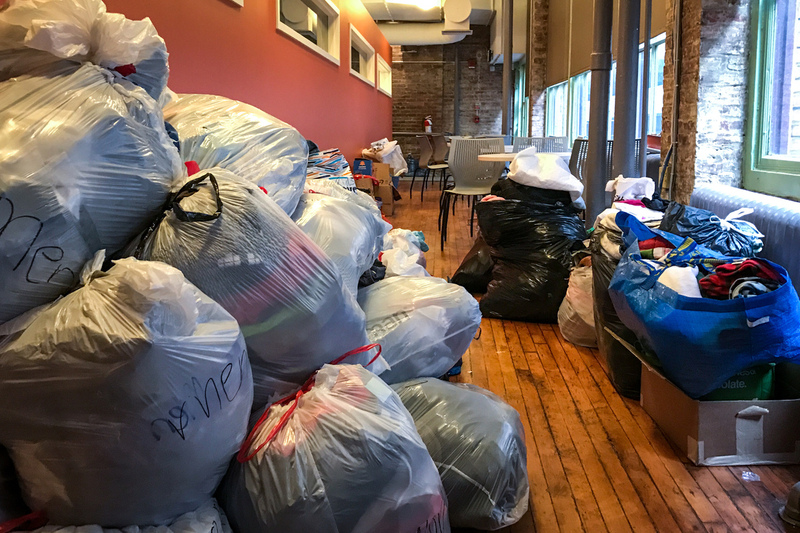 Plastic bags filled with clothing donations pile up in the hallways of the Nationalities Service Center, which has seen an uptick in donations for refugees and other immigrants since Trump's election. Betsy Jenson coordinates donations and volunteers for the agency. She says that while they're waiting for more refugees, they're certainly prepared, given the uptick in donations of clothing, furniture and household goods they've received since Trump's election. They've also heard from a lot of people in Philadelphia who want to help. "We actually just closed off our volunteer applications for the moment, just because we've sort of reached capacity," Jenson says. In Lancaster, a group of leaders from different refugee communities recently met to discuss what more they can do. "We, the refugees and immigrants that are qualified to vote, we have to show at the polling stations in numbers, because politicians look at numbers," said Joseph Sackor, a former refugee who fled civil war in Liberia before he became a U.S. citizen. Sackor added that it's time for more refugees to register to vote once they get citizenship and to reach out to elected officials — for themselves and for others hoping to build a new life in America.